Handbags are getting more capacious, but gadgets must still compete for precious space inside them. A digital camera has to earn its keep with a speedy start, mouth-watering photos and the flexibility to cope with any light conditions its owner throws at it. And it should be simple enough to use even when the wine is flowing and the party is in full swing. This is the brief Fujifilm set itself when developing the Z3, which goes on sale in pink, silver and metallic blue variations to wow the crowds with its looks while turning heads with its pictures. 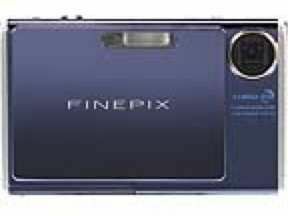 No larger than a pack of small cigars, the camera is driven by Fuji's Real Photo Technology Processor II and houses a Fifth Generation Super CCD HR, responsible for maximising image clarity and detail. Everything about the Z3 is fast: we set it up in its charging cradle, loaded the battery and were recording and reviewing on one charge for seven days, including using the fl ash. A great start, especially as there's no optical viewfinder so you need to rely on the battery-hungry LCD for composing and viewing. Sliding open the front panel reveals the lens and immediately makes the camera ready to shoot in either still or movie-clip mode. In still mode, there are 14 Scene Modes to choose from, including two choices called Natural Light. The first ramps up the ISO in dim light situations to avoid blurring and shake. The other, Natural Light Plus Flash, takes two shots consecutively with and without fl ash, giving a choice between a brighter image and one which retains more detail and atmosphere. Since blurring can be something of an issue with lightweight units such as the Z3, Fujifilm has also included an extra anti-blur button on the back - convenient and easy to find without having to refer to the onscreen menu, where it also appears in the form of an Anti- Blur mode that speeds up the shutter speed sufficiently to improve results for those snappers with less than rock-steady hands. Other shooting options worthy of note are those that cater for capturing fast-moving scenes, and these enable you to keep the shutter open for multiple capture of frames (provided you've room on your memory card). For example 'Final 3' grabs up to 40 frames when you press the shutter, and saves the last three of these when you stop pressing. This feature increases your chances of capturing some entirely candid action sequences rather than just a blurred and useless shot. The F-button deserves a mention too, as it gives access to a second menu of tools when shooting in Manual mode. In this instance, you can set the ISO rating all the way up to 1600, adjust the size and quality of shots and also get creative by opting for black and white or chrome (more vivid colour) shooting. Playback options are standard, with one exception; the Post Shot Assist Window, which displays your last three shots as comparative thumbnails, to act as a guide for composing pictures that fi t with the pose or style of previous ones. By now you'll be asking how the Z3 fares in the field. Well, provided you keep your fingers out of the lens, it delivers some exceptionally good images. The subtlety of colours proves that Fujifilm has really fine-tuned its picture processing lately. However, there are some aspects which are uncomfortable, but mainly these are inherent to any digital camera of this size. Obscuring the lens is one; the other is that when shooting landscapes it's easy to tilt the camera and take pictures where the horizon swings slightly askew - and not realise this until you come to review. But Fuji has thought of that and has included a shooting grid to guide users, so the problem is easily remedied. Other than that, a major stumbling block we found is that in bright sunlight, with the LCD on the factory brightness settings (which can be made brighter or dimmer), composing shots is an 'act of faith', as the screen is practically unusable. But for indoor settings, close-ups of family and friends at parties, or in restaurants with inconsistent lighting, the Z3 is great to have along. The screen is fully visible from any angle which is handy when everyone's clamouring to see your shots. Skin tones that can be bleached out by the fl ash in other cameras, were natural and balanced here and features crisp and clear. We used it on tour and found its bantam weight, speed and readiness to shoot at the drop of a hat, means never losing a holiday moment or having to carry an extra camera bag, and that has to be a good thing.